In stock -This product will ship today if ordered within the next 4 hours and 37 minutes. 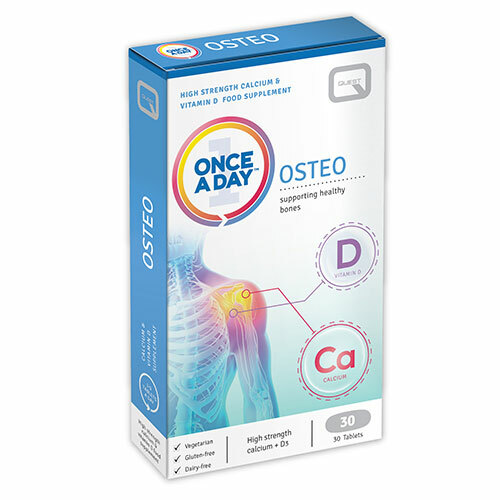 Quest Once a Day - Osteo helps maintain strong bones and supports bone density. mineral amino acid blend (providing calcium complexed with citric acid, glycine, rice flour, rice protein complex, sodium hydroxide, sodium citrate, aspartic acid and maltodextrin) bulking agent: microcrystalline cellulose, magnesium stearate, silicon dioxide, vitamin D3 (with arabic gum, tocopherol, tri-calcium phosphate), glazing agent: hydroxypropylmethycellulose. Below are reviews of Quest Once a Day - Osteo - 30 Tablets by bodykind customers. If you have tried this product we'd love to hear what you think so please leave a review. Quest Once a Day - Osteo helps maintain strong bones and supports bone density. High strength 1000mg daily dose - contains vitamin D.